These free online shape games will help you to recongise the most basic 2d shapes such as circles, squares and triangles to the more complex 2d and 3d shapes. You can learn more about their features, including number of sides, size of angles and tessellating patterns. In this game you’ll progress from organising the triangles and quadrilaterals that pass by on the conveyor belt into their correct groups, to looking at 3d shapes and their faces. In the first section, are the triangles scalene, isosceles or equilateral? And how many matching sides do the quadrilaterals have, if any? There are also some interesting discussion points at the end relating to flat and curved faces and properties of the shape edges. Pack the robots into their boxes, ready to be shipped off to their new homes! Use the control panel on the left to rotate, translate and reflect if you need to, in order to fit them nicely together into the box. There are six levels of difficulty ranging from very simple shapes and templates to the more challenging obscure shapes which may need a little fiddling with before they fit nicely into the box! A fantastically fun place to play around with shapes of various sizes and colours. Make tessellations, symmetry patterns, fun patterns, crazy creatures, anything. Customise the background to a colour of your choice, and the Polygon Playground is yours! Play around with shapes however you like in this surprisingly addictive environment; a lovely and bright place to play about with and become familiar with 2d polygons. A very useful and fun game, ranging from easy to challenging. Match picture halves to their mirror images, but be careful when progressing to the grids, be sure to pay attention to the colour of the blocks! Also don't forget to look at the other section of the game, in which you are presented with an image, shape or letter where you must decide if it is symmetrical or not, post it in the correct letter box to score big points. Ideal for Key Stage 1 and 2 (KS1/KS2). Help Pablo finish his inventions by handing him the right shape. He will describe some parts of the shape to you, it is then up to you to pick the correct shape out of the three in the pile to help him finish his invention! Your goal is to match two cards on the screen. One card will show the name of a shape and the other will show the shape itself. You must match the correct name and shape in order to clear all the cards on the screen to win! When you start a new game, the cards will be shuffled, so every game is a new challenge, keep playing until you feel confident in naming your shapes! Good luck and have fun! The world is being attacked by imposter shapes that claim to be shapes that they are not. 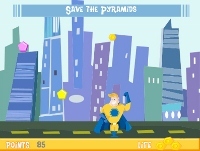 Only you, Hexagon Man, have the power to destroy the imposter shapes and save the world against the attack. Read your mission statement at the top of the page and save the shapes you need to. Use your keyboard arrows to move Hexagon Man around and press space bar and help him blast all the shapes that are not the shapes you’re trying to save, only the right shapes must survive! Collect 200 points and move on to the next round. Good luck, Hexagon Man! Take a look at the shapes presented on the page, then click on the dotted blocks above the shapes to fill them in, one block for each side you can count on the shape below it. Ideal for Key Stage 1 (KS1). An exciting trajectory battle of the tanks! Can be played with one or two players. In your turn, work out from the image of the triangle with its two given angles, what the remaining angle amounts to, enter it into the box at the top of the screen and, if your angle calculations are correct, you’ll blast your opponent. A great game for two players to battle it out! Help the caterpillar and choose from the three shapes to complete the rest of the pictures on the screen. Complete all the pictures to hear a song from Mr Caterpillar! A fun quiz with an unusual reward. Answer 15 questions all about 2d and 3d shapes and their properties and then fling your teacher from a catapult, which you slowly build as you progress, similar to ‘hangman’. Careful however, you must answer all questions correctly, just one wrong answer means you will have to start from the very beginning. You can even design your teacher with various hairstyles, skin colours and features to look like your very own teacher. Your teacher will be impressed by your knowledge if you complete this, although perhaps not by the prize!